Partnering once again with the team at VANEATS, we were invited to sample the #TurnOnTheRajio package. 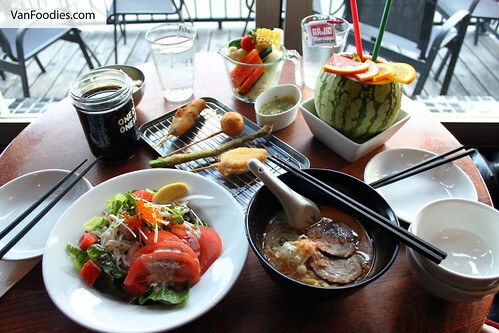 If you remember, last time we checked out Rajio we quite enjoyed it, so I was happy to plan a return visit and I invited LW to join me. Before we began eating, we ordered a Smashing Hit Punch. At first it looked a bit steep at $12, but it was more than a drink. First, it’s served in this cute watermelon cup. 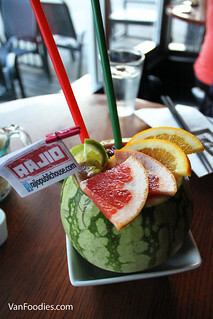 In addition to the cocktail, they also cut the watermelon in cubes and placed them in the cup. Did you know that watermelon works like sponges? The fruit pieces just soaked up all the alcohol so when you eat them they’re extra delicious! It’s like a spiked fruit salad! The Kushikatsu is the house specialty. For this package you will be given 4 deep-fried, panko-breaded skewers at random, upon chef’s recommendation. I have looked at other bloggers’ photos and we all seemed to get different things. I got to try 1) Camerbet cheese, 2) Takoyaki, 3) Beef, and 4) Asparagus. All these skewers come with the house dipping sauce. The skewers themselves do not have a lot of seasoning, but the sauce adds some sweet and savouriness to them, accentuating the flavours. Now remember, only one dunk per skewer. Why? It was recommended by the restaurant; I suspect it has to do with softening the breading and affecting the crispy exterior. 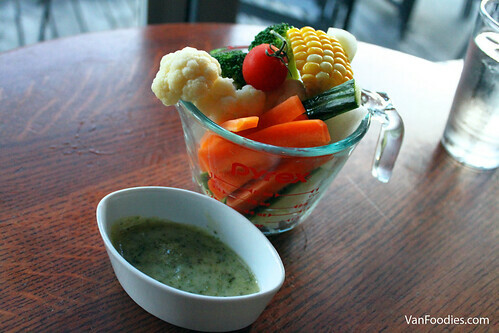 The Bagna Cauda is your Japanese twist of veggie and dip. 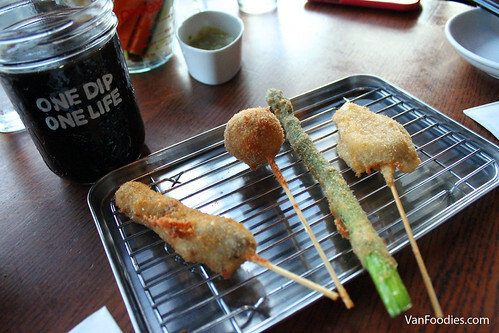 The dipping sauce is made of garlic, anchovy, olive oil and sweet Japanese mayo. It had the umami flavour and this dipping sauce was quite addicting. LW could not stop eating it! I also liked the fact that they boiled the broccoli and cauliflower because I personally don’t like the taste of raw broccoli and cauliflower. 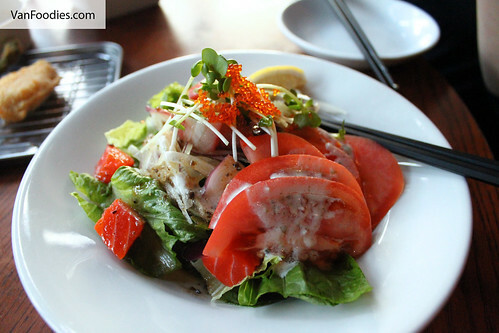 The VANEATS Sashimi Salad once again calls upoon chef’s recommendation on the selection of sashimi. In our plate there were salmon, red snapper, hamachi and octopus. They were added to romaine lettuce then tossed in a kalamata olive soya dressing, topped with tobiko. I’m not an olive fan, but this dressing worked and it’s a refreshing salad. Lastly, we got to try the new Heavenly Ebi Ramen. Instead of the traditional pork broth, this was in a shrimp broth, topped with slices of chashu pork & shrimp infused garlic oil. 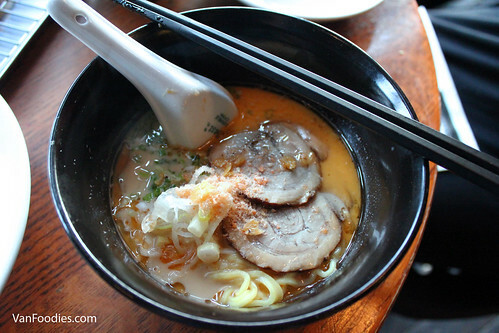 The broth was thick and rich, had prominent seafood flavours; some may find it fishy, but I quite enjoyed it. Noodles were cooked well and the chashu was tender. Because LW and I shared one package, we wanted to order one more dish to round out the dinner. 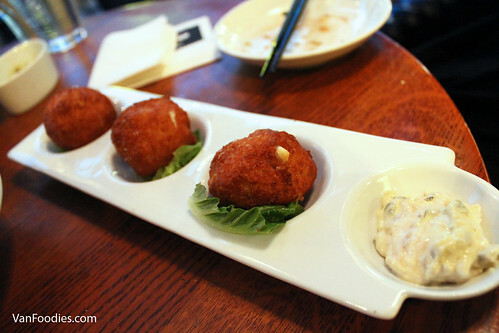 We opted for the Seafood Bombshells, which are fried shrimp and imitation crab meat balls. They were piping hot, crispy, and I was glad that there’s no filler in the seafood balls. I just wish there were more of them. There was no shortage of veggies in the #TurnOnTheRajio package! For $20, this was a healthy (pun intended!) serving of food with Japanese flair. 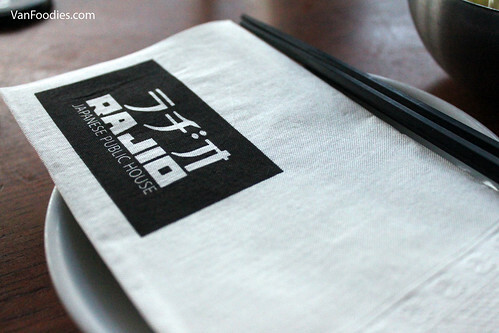 If you haven’t been to Rajio before, this will be a good intro to the restaurant. I suggest going there with a few friends so you can also try their other dishes. The meal was complimentary; however, the views and opinions were purely my own.